18:45 Ahram Online will close its live updates of the day's events here. 18:30 Sources have told Ahram Online that Egypt's two deputy prime ministers, Hossam Eissa and Ziad Bahaa El-Din, will both offer their resigations as well. 18:15 Cairo's underground metro will be closed from 7pm due to the curfew, an official told Egyptian television. It will reopen the next morning at 6am when the curfew is lifted. 18:10 The Coptic Orthodox Church has condemned the continued attacks on churches and Christian properties on Wednesday. Angry mobs attacked and torched tens of Christian properties including churches, monasteries, schools and shops, in a number of locations in Egypt including Alexandria, Suez, and a number of cities in Upper Egypt. In a statement, the church called on the Egyptian armed forces to help the police in maintaining security. 18:00 The US has condemned the violent crackdown on protesters and strongly opposed the declaration of a state of emergency announced by Egypt’s military-backed government. White House spokesman Josh Earnest urged Egypt's military leaders to respect the basic human rights of the Egyptian people. Earnest said the violence will only make it more difficult for the parties involved to return to the path of peace and democracy. 17:50 Mohamed ElBaradei, vice president for foreign affairs, has offered his resignation, sources confirm to Ahram Online. There are ongoing negotiations to try to convince the one-time Nobel peace laureate to withdraw his resignation, which has not yet been officially announced. 17:45 More details about the curfew. It has been imposed on 12 out of 27 governorates - Cairo, Giza, Alexandria, Suez, Ismailia, Assiut, Sohag, Beni Suef, Minya, Beheira, South Sinai, and North Sinai. It will last for a month, and those who do not abide by the curfew will be imprisoned, according to the cabinet’s statement. “We reject the Brotherhood’s attempt to enlarge the circle of violence in Cairo and the governorates, as well as their targeting of churches and police stations,” said the group’s statement, released on Wednesday evening. 17:35 State television and private channel ONTV are showing pictures of a steady stream of supporters of Mohamed Morsi leaving the Rabaa sit-in with their hands in the air. State television reports that they have been offered a safe exit by the interior ministry. 17:10 In Sohag, two have been reported killed and eight injured, including three CSF conscripts, by live fire from pro-Morsi demonstrators in Thaqafa Square, according to Ahram Arabic. Morsi supporters set ablaze several shops in the square’s vicinity and in front of the main Coptic Orthodox church. The fire has been successfully put out. 17:00 Thousands of pro-Morsi protesters are marching on the 6 October Bridge – blocked by armoured police vehicles – trying to find their way to the main Rabaa Al-Adawiya protest camp. There are still hundreds of people at the site, and more trying to enter. 16:55 The cabinet has declared a curfew from 7pm tonight until 6am tomorrow morning. 16:45 Scuffles are ongoing in Al-Haram Street in Giza, near Al-Nahda Square, as protesters move to set up a stage at Nasr Al-Din street in an effort to establish a sit-in. Police fired teargas to disperse the crowds. Ahram Arabic reports that police also prevented an attempt to break into the nearby Al-Talebeya police station. 16:40 Islamist politician Mohamed Selim El-Awa has urged army chief Abdel-Fattah El-Sisi to order police to stop killing pro-Morsi protesters and to immediately start dialogue with the pro-Morsi camp. El-Awa, in a phone interview with Al Jazeera Mubasher Misr, said that Egypt’s military-backed government has ignored calls for negotiations on political proposals which the Muslim Brotherhood and its allies had agreed to discuss. El-Awa described the attack on pro-Morsi vigils by police as an “inhumane crime by legal and constitutional standards around the world” and warned of the dangerous ramifications if violence, which has spread to several governorates, continues between both parties. 16:20 The interior ministry announced it has arrested 543 people allegedly involved in clashes and riots in Cairo and several governorates nationwide. In a statement the intefior ministry said that those arrested had "automatic weapons, birdshot and ammunition." 16:15 Supporters of Morsi set fire to a military building in Marsa Matrouh in western Egypt, reported Ahram Arabic news website. Clashes have been ongoing between supporters of Morsi and security forces since this morning. 16:05 Egypt's health ministry has raised the casualty toll from today's events to 95 deaths and 874 injuries nationwide, ministry spokesman Mohamed Fathallah announced. 16:00 Gamal Eid, human rights lawyer and director of the Arab Network for Human Rights Information (ANHRI), told Ahram Online that declaring a state of emergency was required to justify the army's deployment to restore order. A state of emergency gives the police greater powers to arrest and detain people without a court order. Eid says the move gives legal cover for ordering the army to restore security and added that a detailed decree will be issued later stipulating the state of emergency, which he said may be coupled with a curfew. A state of emergency was in place in Egypt from 1967 to 2012. 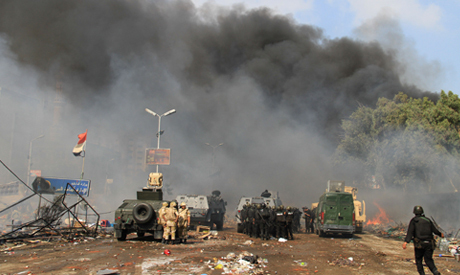 15:55 Violence continues in governorates all over Egypt this afternoon. In Sharqiya governorate, one person is confirmed dead and three injured during an attempt to storm the Abu-Kebir police station, a health official told Ahram Arabic website. 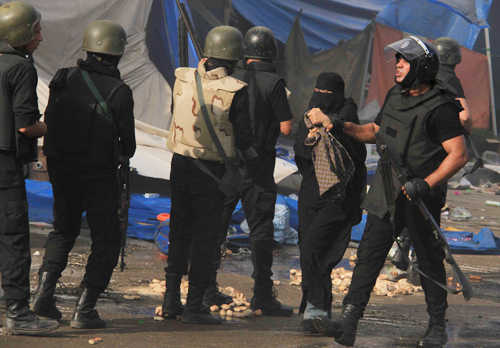 In Luxor, three were injured during clashes between supporters and opponents of Morsi. Pro-Morsi supporters torched a hotel and several shops owned by Egyptian Christians. In Beni Suef, Morsi supporters took over a police station in Al-Wasty district seizing weapons, reported Ahram Arabic website. Supporters of Morsi and security forces have been exchanging gunfire, leaving at least seven confirmed injured. In Assiut, Morsi supporters torched a court building, throwing Molotov cocktails after they failed to storm the building, reported Ahram Arabic website. A church was also set ablaze in the city of Assiut. In Daqahliya governorate’s Mansoura, residents clashed with supporters of Morsi when attempting to build a wall to block the Al-Geish road, reported Ahram Arabic. 15:50 Leading Brotherhood member Mohamed El-Beltagi has confirmed earlier reports that his 17-year-old daughter was killed during clashes at Rabaa. Asmaa El-Beltagi succumbed to her injuries after being shot at Rabaa Al-Adawiya. El-Beltagy described the events to Al-Jazeera’s Mubasher Misr channel as a "massacre," saying that "all squares in Egypt are now revolutionary squares that will hold sit-ins” in protest. 15:50 The EGX30 stock market index closed Wednesday trading on a 1.7 percent drop, at 5,549 points. Turnover reached LE350 millon ($50 million). 15:45 In the city of Tanta in Gharbiya governorate, locals formed a human shield around the Mar Girgis church to protect it after Morsi supporters attacked it with stones, reported Ahram Arabic. 15:43 Egypt's presidency has declared a state of emergency in Egypt, to last for one month. The president ordered the army to take all necessary measures to preserve security. 15:40 There have been a number of reports of violence against the media in Cairo today. As well as the death of Sky News cameraman Mick Deane, the death of Habiba Ahmed Abd El-Aziz, a reporter for UAE's Gulf News, has been confirmed. Both were killed at Rabaa. Egypt's Journalists Syndicate issued condolences on El-Aziz's passing, and called for urgent investigations into the incident. MENA reports that a number of other journalists were injured while covering the violence, including Al-Masry Al-Youm photographer Ahmed El-Naggar and Al-Watan reporter Tarek Abbas. 15:35 The total death toll across Egypt has reached 60, with 874 injured, according to health ministry officials. 15:30 In Fayoum, south of Cairo, the death toll has climbed to 17 following clashes at police stations between Morsi supporters and security forces, MENA said, quoting a provincial hospital official. Seventy others have been wounded in the clashes in the governorate. 15:25 In Kafr El-Sheikh city, north of Cairo, a 25-year-old pregnant woman from the city of Hamoul was shot dead and 12 others were injured by gunshot wounds during clashes with security. Several security personnel were injured during the clashes at Nasr Square where thousands of pro-Morsi protesters had gathered. The security personnelwere transported to hospital. 15:20 Salafist Nour Party spokesperson Sherif Taha told Ahram's Arabic news website that dispersing the pro-Morsi sit-ins will complicate matters and spread unrest, warning against the danger of dispersing sit-ins by force. Taha called on protesters to avoid violence for the good of Egypt and called on them to stop attacking churches and public institutions, saying civil war will happen if the situation isn't contained. 15:10 The UK's Sky News TV channel confirmed the death of its cameraman Mick Deane in the Cairo as he was covering the dispersal of a pro-Morsi sit-in in Rabaa. In an official statement the news network said, “Mick was part of a Sky News team reporting on the disturbances in the city with Middle East Correspondent Sam Kiley when he was shot and wounded. Despite receiving medical treatment for his injuries, he died shortly afterwards.” According to the statement, Deane, 61, had worked with Sky News as a camera operator for 15 years and was married with two sons. 15:00 The latest updates on the death toll vary widely. Egypt's health ministry says there are 15 deaths so far from clashes at both sit-ins in Cairo and Giza, and 203 injuries. The Muslim Brotherhood says the Rabaa Al-Adawiya sit-in field hospital alone has recorded 2,200 deaths and over 10,000 injuries. However, Mohamed El-Beltagi, senior Brotherhood figure, announced that there were at least 300 dead in Rabaa. A death tally by AFP says 124 were killed at the Rabaa Al-Adawiya sit-in alone. The news agency said many seem to have died of gunshot wounds. 14:55 The EU has issued a statement urging all sides to exercise maximum restraint. "Confrontation and violence are not the way forward," said Peter Stano, spokesman for EU foreign affairs chief Catherine Ashton. "Reports about deaths and injuries in this respect are extremely worrying." 14:50 In Luxor, a hotel has been torched by Morsi’s supporters in addition to some shops owned by Egyptian Christians on Karnak Temple street, according to Ahram’s reporter in Luxor, Iman El-Hawary. 14:45 Major roads leading into Cairo have been closed off, some by police forces and some by the Egyptian military. The military closed down the Cairo-Alexandria agricultural highway near Qaliyoubia city. The police and the military also closed down the Cairo-Belbeis agricultural road leading to Cairo. 14:40 Clashes in Suez governorate - east of Cairo - left five people dead and 40 injured according to health officials, MENA reported. 14:35 Further attacks on Egyptian churches are being reported. In Al-Arish in North Sinai, unknown assailants have torched the Mar Girgis church, reports Ahram Arabic. In Minya governorate, Morsi supporters have torched two more churches, Deir Mina and El-Agayby, both located in the city of Minya itself, reports Ahram Arabic. Ahram Arabic reports three churches torched today in the governorate, while Asway Masriya says that four churches were set on fire and another three others attacked. 14:25 The Brotherhood’s official spokesperson Gehad El-Haddad announced that Asmaa Mohamed El-Beltagi, the 17-year-old daughter of Brotherhood figure Mohamed El-Beltagi, has been killed during the security crackdown on the Rabaa Al-Adawiya sit-in. 14:20 Ahram Online’s Sam Kimball was in Mohandiseen around an hour ago, where a sit-in is now underway by hundreds of protesters. Kimball reports that birdshot and teargas was being fired by security forces into the Mohandiseen sit-in which is located next Mostafa Mahmoud Mosque. Kimball reports hearing sounds of gunfire but was unable to confirm whether they were live rounds. The Morsi supporters have constructed makeshift barriers using benches torn up from nearby streets to partially block traffic in Gamat El-Dowal Street, protecting the sit-in. Burning tyres have been put around the perimeter. 14:15 Six security personnel –three officers and three conscripts – have been killed by gunfire while breaking up the Rabaa Al-Adawiya camp, a security source told state news agency MENA. Sixty-six others were injured in the process. There are some more official figures for injuries in various governorates. Seven people have been killed and 96 injured in clashes in Beheira, Beni Suef, Suez and Minya governorates, according to official health ministry figures. 14:10 Journalists in Egypt are reportedly encountering difficulties when they try to cover the violence. Correspondent for the Daily Beast Mike Giglio writes on Twitter that he was “arrested, beaten by securtity forces and then held at a local arena.” He writes that his laptop, wallet and mobile phone were confiscated and not returned, and that freelance Egyptian photojounralist Mahmoud Abou Zeid was detained with him and is yet to be released. “Authorities knew full well that I’m a jouranlist while arresting me today. It actually seemed to get me some extra punches,” Giglio writes. 14:00 At least 9 people have been killed in Fayoum following fighting at police stations between protesters and security forces, Reuters reports. Morsi supporters had attacked two police stations in the city. which lies 130km south of Cairo. 13:45 There have been further international statements of concern about the dispersal of the sit-ins. The Qatar foreign ministry reportedly called on Egyptian authorities to "refrain from the security option in dealing with peaceful protests, and to preserve the lives of Egyptians at protest sites." Turkey's President Abdullah Gul said that "armed intervention on civilians, on people demonstrating" is "completely unacceptable." Both Qatar and Turkey were strong backers of Mohamed Morsi's government. Iran, meanwhile, has condemned the "massacre" in Egypt. 13:30 A security source told Egyptian state television that reports that Brotherhood figure Mohamed El-Beltagi has been arrested are incorrect. Sources who talked to Ahram's Arabic news website said that El-Beltagi and Islamist preacher Safwat Hegazy, who is close to the Brotherhood, were being besieged by security forces in a house close to the Rabaa sit-in. El-Beltagi and Hegazy both face charges of incitement of violence and attempted murder, but have avoided arrest by staying within the Cairo sit-in, often appearing on the sit-in's stage addressing the crowds or speaking in press conferences. 13:20 In Suez there have been two confirmed deaths by live fire, a health official told Ahram Arabic. Fifty-three injuries have been reported. 13:15 Protests in Alexandria are ongoing; Ahram reports that protesters set fire to a government building in the suburb of Kom El-Deka and clashed with security forces at El-Raml train station located nearby. The demonstrators stormed the government building and set parts on fire. 13:10 UAE media outlet Xpress is reporting on Twitter that its reporter Habiba Ahmed Abd Elaziz has been "shot dead in Cairo." No further details have been released yet. 13:05 Alastair Beach, a reporter with the UK daily the Independent, is at Rabaa field hospital, where he reports seeing 42 bodies. "Pro-Morsi protesters have barricaded themselves inside upper floors of field clinic as live fire crackles outside" he tweets. 13:00 In Luxor, clashes have been going on since Morsi supporters staged a protest in Abu Haggag Square. During this time the protesters burned a police car, attacked a policeman stealing his weapon and uniform in addition to attacking a number of shops, according to Ahram’s reporter in Luxor, Iman El-Hawary. Pro-Morsi supporters have also attacked four police stations in the governorate of Giza. 12:55 Al-Azhar, Egypt's leading Islamic institution, said that it was not aware of plans to disperse the sit-ins and that it had learned about them through the media. Al-Azhar's grand imam Ahmed El-Tayyeb said in a spoken statement broadcast on Egyptian television that Al-Azhar should not be dragged into political conflicts. He called for "self-restraint" and giving priority to "the national interest", condemning violence and bloodshed. 12:50 In Fayoum in Upper Egypt, pro-Morsi supporters set fire to a Christian youth centre located next to the Muslim youth centre where they had been protesting, reported Ahram Arabic. The protesters also set fire to a rest house located near the Fayoum-Cairo highway, while security forces blocked roads leading to government headquarters and blocked off the highway. In Aswan, three people have been confirmed dead at the university hospital, with 22 injured, after clashes between protesters and security forces. Morsi supporters have torched 5 Central Security Forces vehicles and took guns and teargas canisters from inside the trucks, Ahram Arabic reported. 12:45 In a brief televised statement, Egypt's interim government said it would react sternly to any acts of sabotage and attacks on state institutions. The government vowed to safeguard the right to political expression as long as it remains peaceful and stays within the domain of the law. “The government insists on moving forward with the future roadmap in a way that guarantees that no faction will be excluded from participating in the political process which will achieve a democratic transition,” the statement read. 12:40 The stock market has, unsurprisingly, not reacted well to today’s violence. The EGX30, the main index of the Egyptian stock exchange, dropped 1.68 percent by 12:40pm to sit at 5,550 points. Trading volume floats at around LE230 million. The market had neared a six-month high on Tuesday. 12:35 The international community has expressed concerns about the dispersals of the demonstrations. An European Union spokesman has said that reports that protesters had been killed in a security force crackdown were "extremely worrying" and called for restraint from Egyptian authorities. The German foreign minister has also called on all sides to "return immediately to negotiations and avert an escalation of violence." Alistair Burt, the UK foreign minister, wrote on Twitter several hours ago that he was "deeply concerned at events continuing today in #Cairo leading to deaths and injury. Restraint and dialogue more urgent than ever." 12:30 There have been a number of reported attacks by protesters on police stations around Egypt. An attack on tthe Abu Kurkas police station in Minya left eight dead and at least 30 injured according to a medical source, reported Ahram Arabic. Members of the Muslim Brotherhood have also attacked police stations in Fayoum, Assiut, Helwan, and Sharqiya while a police car was set on fire in Luxor. 12:25 Egyptian state television is reporting that protesters at Rabaa Al-Adawiya threw a Central Security Forces (CSF) vehicle off the nearby 6 October Bridge. The vehicle had five police conscripts inside. The report is unconfirmed. 12:20 The Al-Gamaa Al-Islamiya ultra-conservative movement called on supporters of toppled president Morsi to take to the streets to condemn what it termed "coup crimes." There have been a number of attacks on churches around Egypt this morning, including in Minya and Sohag. 12:15 Violence continues in the cities on the Suez Canal. Reports of violence against Christian targets in Suez. Ahram Arabic reports that pro-Morsi supporters threw Molotov cocktails at the Al-Raey Al-Saleh Church and set three military vehicles on fire. Clashes are ongoing between protesters and military forces. In Ismailiya, a military officer and a conscript were shot dead on the highway connecting the city with Cairo, by unknown assailants reported to have fired from a car. Two other officers were injured, reported Ahram Arabic. 12:10 A BBC reporter has said that gunfire is currently being exchanged between both sides at Al-Nahda Square in Giza after the dispersal of the pro-Morsi sit-in. Ahram Online reporter Mai Shaheen, who was at the sit-in earlier, confirmed that automatic weapons were being fired by Morsi supporters at police from within Al-Orman Gardens adjacent to the square. 12:05 According to Ahram Arabic, Mohamed El-Zaki, a photographer for Al Jazeera Mubasher news network was injured during clashes at Rabaa. Zaki was shot in the hand while covering the clashes. A reporter for Sky News Arabic was also reportedly shot by live ammunition and is being transported to hospital. 12:00 In a cabinet statement earlier this morning, the government reiterated the interior ministry's claims that the police have been demonstrating "restraint" and using only teargas and water cannon. There have been many reports to the contrary, including an Ahram Online reporter who was caught in the crossfire between protesters and police at Al-Nahda, with live fire being used on both sides. 11:55 Senior health ministry official Mohamed Sultan said in a statement to state news agency MENA that the death toll from the sit-in dispersals had reached 13, five of which were security forces – two officers and three conscripts. Sultan said the injury toll had reached 98, including many from live fire, shotgun pellets and teargas. The Muslim Brotherhood's Freedom and Justice Party said in their latest statement that the Rabaa Al-Adawiya field hospital has over 500 dead and 9,000 injured. All figures are impossible to verify at the moment, especially as security forces are making in hard for reporters to access the sit-ins. However, an AFP reporter earlier counted 43 bodies at the morgue at the Rabaa Al-Adawiya field hospital. 11:45 The interior ministry says that security monitoring has revealed that leaders of Muslim Brotherhood have "given orders to their members in the governorates to attack police stations." In a statement published by state news agency MENA, the ministry said that the Brotherhood has already started "implementing the plan in Cairo, Beni Suef, Minya, Assiut and Sohag." The ministry's forces are combating these attempts, it said, and warned citizens against approaching "any police facilities." 11:40 There are reports of ongoing protests and clashes all over Egypt. In Alexandria, hundreds of members of the Muslim Brotherhood are reportedly clashing with security forces on the corniche, the main sea-front road. Brotherhood members have attacked security forces with stones and pellet fire, while the police respond with teargas. Several public buses have also been set on fire by protesters. In Suez, pro-Morsi protesters fired at an army truck during a march headed to the governorate headquarters and the local security directorate. According to Ahram Arabic, Morsi supporters also set on fire a Franciscan school as well as a number of shops and cars, all located on Al-Geish Street. In Ismailiya, Ahram’s Khaled Lotfy says that pro-Morsi protesters have been throwing Molotov cocktails at court buildings while security forces attempt to control the fire and secure other governmental buildings in the area. In Upper Egypt, clashes between protesters and the police continue in Assiut with pro-Morsi protesters throwing rocks and setting a police car on fire in Mahata Square, according to Islam Radwan, Ahram’s reporter in the city. In Wadi El-Gedid governorate in Egypt’s Western Desert, dozens of pro-Morsi supporters headed to the local post office to close it down and attack security forces there, according to Mahmoud Abbas, a post office manager. He told Ahram’s Khaled Karish that locals in the area stopped the attack and the protesters headed on to the governorate building. 11:35 The Strong Egypt Party has said that it holds the Egyptian authorities responsible for the “deaths of the victims” today. Spokesman Ahmed Imam said that the dispersal of the sit-ins is a "crime" that will lead to more violence. 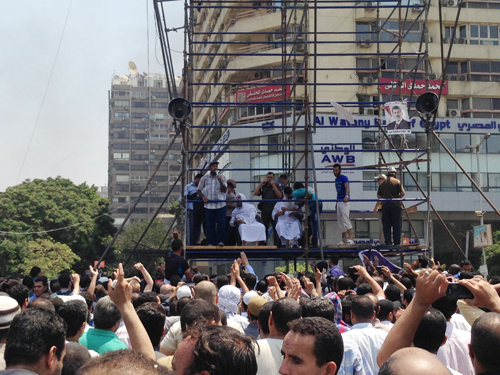 The party, which is Islamist-oriented, took part in the 30 June protests against Morsi but rejected his ouster by the military, describing it as a "coup." 11:30 Clashes continue at Rabaa where security forces are inside the camp, with the sounds of gunfire echoing in the area. 11:20 A priest named as Ihab told Ahram’s Haggag El-Husseini that the Dalga church in Deir Mawat located in Upper Egypt’s Minya governorate is under attack. The main Coptic Orthodox Church in Sohag city, also in Upper Egypt, has been set ablaze by pro-Morsi protesters, reports Aswat Masriya. It is located close to Thaqafa Square, where thousands are protesting against the sit-ins' disperal. 11:15 Egyptian police on Wednesday morning attacked two large sit-ins being held by supporters of Mohamed Morsi in Greater Cairo. The smaller sit-in at Al-Nahda Square in Giza was completely dispersed according to the interior ministry, while the larger demonstration at Rabaa Al-Adawiya mosque, across the river in east Cairo, is surrounded by police and under heavy fire. Many key highways around Cairo are blocked off by security forces, particularly those leading to the sit-ins. The railway authority said it had stopped all train services in and out of Cairo "for security reasons and to prevent people from mobilising". The death toll from the attacks is hard to ascertain; the health ministry has reported ten dead across Cairo in the incidents, but their reports are based on figures from public hospitals, and do not include those bodies that have yet to reach official healthcare facilities. At the Rabaa field hospital, an AFP correspondent reported seeing 43 dead bodies. Egyptian state television has said that two police personnel, an officer and a conscript, were killed and six wounded during the attempt to clear out the two sit-ins. There are also reports of violence in the middle-class Giza district of Mohandeseen and in Maydan Al-Giza, in the Giza district, between Morsi supporters and police.